Recently I made a contact with very special environmental artist and writer Abigail Doan, the editor of e c c o * e c o. As she states on her profile: "I am a writer, editor, and environmental artist residing in NYC, Sofia, and rural Italy. 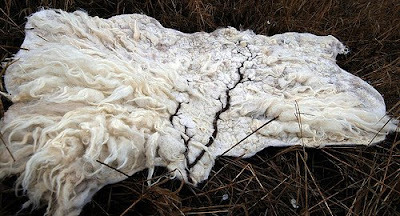 My eco-textile and art farming projects are a means to create sustainable solutions and key visual links to the global challenges we collectively face. I am also a mother of twins." Abigail caught my view with her sensual, fragile, tactile fibre art installations and projects that merge with the surrounding space and become a natural continuation of the nature. Abigail entangles her ideas of "environmental tinkering and sustainable practice" into her projects. 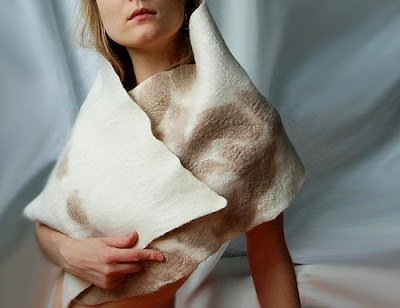 I am so thrilled to have recently made contact with Vilte Kazlauskaite, a super talented eco fashion-forward felter from Lithuania. Her one-of-a-kind felted wool, silk, flax and other natural material creations are totally handmade and part of a long tradition of fiber art in her exotic homeland. Vilte states, "I started my journey into magical world of felt about three years ago. I was a psychologist and dance therapist before then. Felting became an important part of my life. I got so into it that I also published a book, Veltinis ("Felt") about the unique felting technique in Lithuania, the first book of its kind covering this form of textile art." I love the spirit of Vilte's designs and the sustainable alchemy that she so effortlessly conjures. Her entire collection is an inspiring example of the future of contemporary fashion being rooted in indigenous methods and earth friendly goodness. Posted by Abigail Doan at 11:23 PM "
Abigail Doan – į aplinką orientuota tekstilininkė-menininkė, rašytoja ir etiškos ir ekologiškos mados dienoraščio ecco*eco redaktorė, gyvenanti New York’e, Sofijoje ir Italijoje. Abigail instaliacijos – itin jautrios, trapios, taktiliškos, įsiliejančios į aplinką ir ją pratęsiančios. Labai vertinu tai, jog tokie kūrybiški žmonės kaip Abigail pristato mano darbus savo dienoraštyje. Ačiū, Abigail!